Published Jul 2019 by Marvel. 1st printing. Collects Thanos (2016-2018 Marvel) #13-18, Thanos (2018 Marvel) Annual #1, Cosmic Ghost Rider (2018 Marvel) #1-5 and Thanos Legacy (2018). Written by Donny Cates and Gerry Duggan. Art by Geoff Shaw, Dylan Burnett, Andre Lima Araujo, Flaviano Armentaro, Frazer Irving, Geoffrey Shaw, Katie Cook, Will Robson, Brian Level, Jordan Boyd, and Cory Smith. Cover by Geoff Shaw. Ask the most powerful beings in the galaxy how they fear the universe will end, and in their most honest moment, they will answer with two words: "Thanos wins." Now that disturbing thought becomes a horrific reality! See what happens when the Mad Titan achieves his ultimate victory. Will he cause the cosmos to spiral downward into chaos and death...or will something very different happen? Plus: In the far future, an iconic and unexpected Marvel character has become - the Cosmic Ghost Rider! But following his experiences at the Titan's hands, what are his vengeful plans for...baby Thanos?! 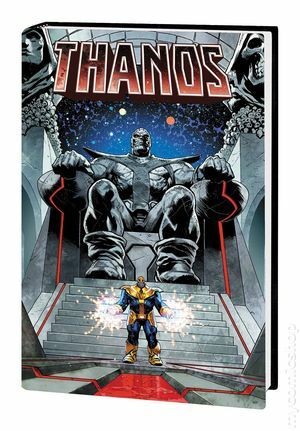 Donny Cates explores Thanos' full legacy in a thrill ride that spans all the way from the end of time to the stunning events of Infinity Wars!